Pet waste is both an aesthetic and environmental problem. 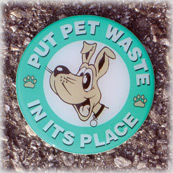 Encourage the proper disposal of pet waste by putting an educational message where it will do the most good. Our colorful Doo Dot das Curb Markers can be installed on just about any flat non-soil surface using your choice of das Curb Marker Adhesive. Because they’re das Curb Markers you know that they’re durable. Doo Dots will serve as a visible yet unobtrusive reminder to pet owners for years to come. Everything you need in one convenient package for a special price. Your choice of stock markers. Place a message directly where pets do their business - in the grass. Our das Soil Markers are durable, low profile, and vandal resistant. Drive the 13” stake through the center of the 7” soil marker for a bright, highly visible, ground-level message. Fade Resistant: UV stable for maximum color retention. Vandal Resistant: Anchor barbs make removal extremely difficult. Rugged: The marker can be walked on, mowed over and driven on. 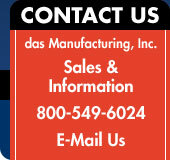 Our colorful 9” das Flyers are available in your choice of three stock designs. Custom colors and imprinting are also available. Have some fun with your best friend and help spread the message.